It’s the promised guide you’ve been waiting for! I’m breaking this into a number of parts, hopefully making it perfect lunch reading material. So let’s start, how would one be able to create an award-winning army? Go with your heart. If you’re attracted to it, you’ll definitely put in the effort to make it something you’d be proud of. I had my eye set on Brets from the start, despite knowing how difficult it would be to paint, which leads me on to the second point. But I don’t think I can paint well. You’d surprise yourself if you try, I certainly did given I’ve never painted a mini before! There are loads of tutorials out there and trust me, I spent hours upon hours reading these, trying things out as I went along. And since you’re reading a T4G article, you’re already on the right track! I’d rather just dip the miniature. There’s nothing wrong with dips or washes, especially if there’s lots of recessed areas and details. It gives a great result straight away, but don’t stop there. Add the next highlight, make the mini really pop. You’re not going to ruin it. But flat surfaces with little detail is still a nightmare! Think of it as a canvas where you can go wild. Patterns often give an illusionary effect that means you don’t need as much shadows and highlights. I still think my freehand is weak due to my shaky control, but with methods like Addition+Subtraction, you can work out a simple design which people immediately admire. 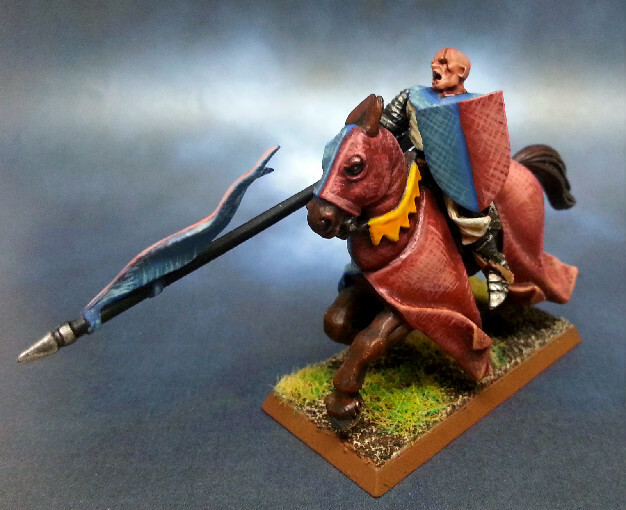 Also, painting tricky miniatures is like throwing yourself in the deep end – you’re bound to improve much faster. Same goes with gaming, don’t play chumps and be happy with wins, play against better opponents and learn from your losses. Now, this is probably a huge part of nabbing those nominations/prizes. I initially thought I would just be a casual gamer and rushed into building/painting my army. If I could re-do it again, I’d have taken a step back and really plan it out. A good place to start would be a theme and the colour scheme to go with it. 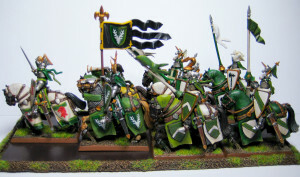 Army painting is very different from painting a single model for display. Cohesion is key and a strong theme done in a well-thought out colour scheme will catch the eye far more than technical painting. With my Brets, I had a rough theme in mind. The Verdant Guard were protectors of the sacred sites of Bretonnia, which were glades and forests since the Lady was closely linked to nature and the Fey. I started off with green, earthy tones and then diverged into various greens to mix it up. So far, so good. 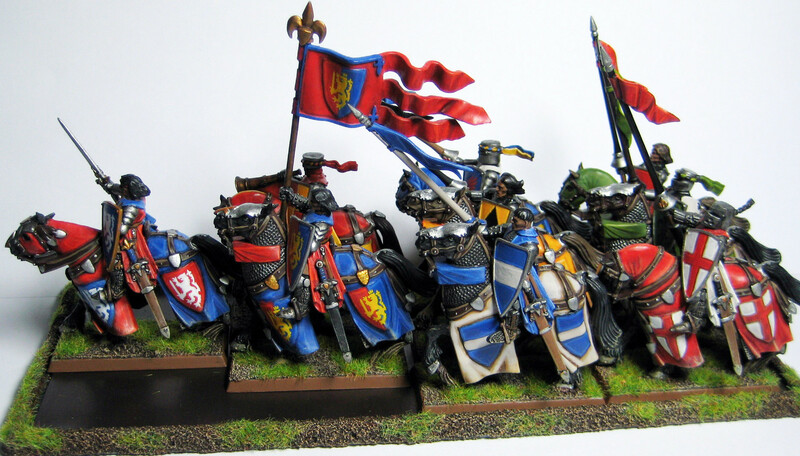 In my mind, it was fluffy to have Errants from other regions assist the Guard, and these I painted in the varying colour schemes of Bretonnia. However, what works in your head may not work in practice and you can’t be constantly explaining your fluff to everyone. It needs to jump out at you just by looking at it. If this were any other army, I’d be doomed as the two are not cohesive! I’m lucky that Brets work as a rainbow mess, but I do feel that it’s not everyone’s cup of tea. It’s why I’m currently working on expanding my collection so that eventually I can field a pure Verdant Guard, charging out from the leafy groves, as well as the King’s host, with knights from all across the land. As for colour scheme, get as many references as you can, look at the colour wheel, play around with combinations and work some test models before committing. Try to avoid the official colour schemes as you’ll always be compared, and go for something unique! Now that you’ve got a theme, get the basing right. Faces and bases – a mantra I’ve been taught but kinda failed to follow. While simple, the common sand & static grass just isn’t enough these days. There’s loads of options to choose from and you can even use scenic bases if you have the cash to spare. The basing should either accentuate the theme or be used as a contrasting point. It should have enough detail to make it interesting, but not too much that it becomes overly cluttered and detracts from the miniature. There are loads of tutorials out there, but here’s a link to Andy’s and Andrew’s here on T4G. 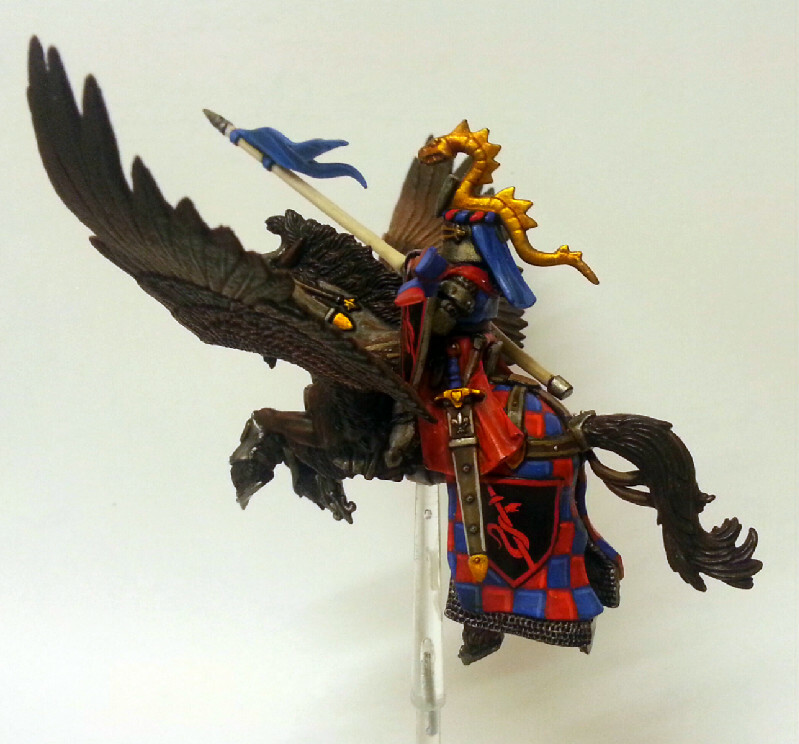 My advice is to test out a basing scheme together with your colour scheme before you progress any further. Guess that’s enough for Part 1 – stay tuned for the next instalment where I’ll discuss further things you should do in your quest to create a great army! This entry was posted in Army Blogs, Bretonnians, Painting Tips, Painting to Improve, Warhammer Fantasy and tagged Andrew, Andy, basing, Bretonnian, Brets, Colour scheme, Errants, how to paint warhammer, KotR, Ming, Paint award, Painting Tips Videos, Pegasus Knight, T4G Painting Tips, warhammer, warhammer army, warhammer fantasy, warhammer painting. Bookmark the permalink. Thanks for the cool write up and the links. It’s great to see such nicely painted models that were a first attempt. I also love Bretonnia but have because of the painting difficulty. So I’m a bit of a sell out I guess but I do still like Wood Elves quite a bit. Glad to have found your blog, I will be visiting frequently! Wow, I just reread my post and I really ought to proof read first!! So, what I meant to say is that I like Brets, and have collected them in the past. But now that I’m in a financial position to actually invest in some models and paint (like 17 years later), I decided to go with Wood Elves because I believe they will be quite a bit easier to paint. 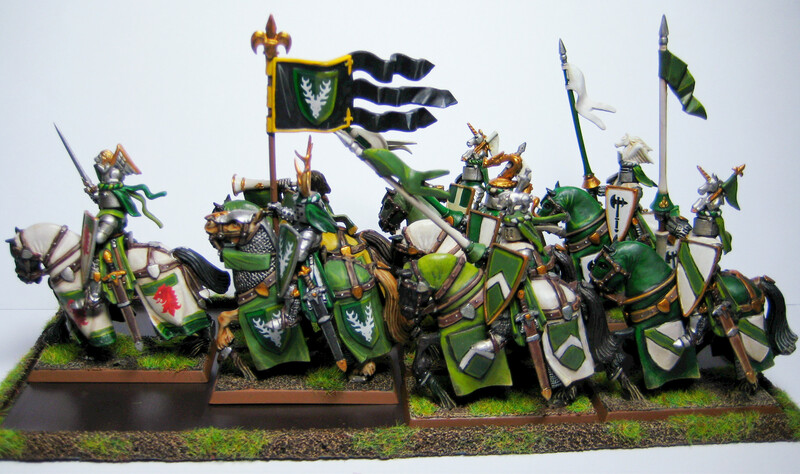 And I do really like the look of the models and am excited about collecting them, but I kinda feel bad for passing up Bretonnia because they are just AWESOME.